I do also think there were several options. I put a Blaupunkt Frankfurt to my S1 car! It is the same building year and fits (to my mind) best of all possibilities! The cool thing ont the Blaupunkt radios is ! They have a (I think it ist called Plug) DIN-Stecker, which bridges the Radio and the Amplifier. You can buy a switch with two cable lines, and then you can play your mp3 Player , for example in your glovebox, throgh the old radio, and if you want listen to the radio, you simply switch. For me the best thing in any way, cool original looks and "modern" music. The Radio fits if you cut a little of the plastic panel on the left and the right (abou 3mm all). @ all Thanks for the nice welcome! I'm really happy about that! I can put some further Fotos Online, but do I understand it right, that I have to save them on "my site" with a maximum of 1mb? Thanks for your help! 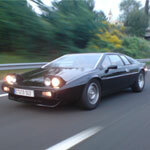 Hi, does anybody have a original Steering boss for the two spoke steering wheel of a Lotus Esprit S1. And wants to sell it to me? Would be really great! Thanks for any reply! I hope it works now! Thanks for the nice welcome! I hope I manage it to put some imagrs online!